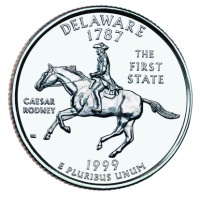 The Delaware State Quarter was the first quarter issued under the 50 States Commemorative Coin Program Act. It was released on January 04, 1999, the first of five state quarters issued that year. The design for the Delaware Quarter was chosen from over 300 designs submitted by Delaware state residents to the Delaware Arts Council. The winning design was submitted by an art and drama teacher at Caesar Rodney High School which was very fitting considering that the design depicts Caesar Rodney. Caesar Rodney was a delegate to the Continental Congress who made an 80-mile historic horseback ride to Philadelphia in order to vote in favor of our nation's independence. His vote was the deciding vote in our nation's strive for independence and it is very fitting that he would be commemorated on the Delaware Quarter. He made his journey on July 1, 1776 in spite of the fact that he was suffering from asthma and cancer. And as if that weren't enough hardship, he also had to endure a summer heat wave and thunderstorms on his journey, arriving just in time to cast his momentous vote. Below is a table showing the design specifications and mintages of the Delaware Quarter. Note: The modification moved some of the wording from the reverse to the obverse to leave the reverse available for the state's design. Reverse - Each state theme was proposed, and approved, by the governor of the state. Final design was created by William Cousins. His initials appear in front of the horse's hoof on the left side of the coin.